In 2005 US comedian Stephen Colbert coined the term truthiness to describe the things people claim to know "from the gut". It rapidly became part of the lexicon, achieved Word of The Year status, and culminated with the 2006 White House Correspondents' Association dinner where Colbert gave a bitingly satirical speech in front of an unimpressed President Bush. As Colbert said later, "It used to be, everyone was entitled to their own opinion, but not their own facts. But that's not the case anymore. Facts matter not at all. Perception is everything. It's certainty." This concept of assertion as fact is at the heart of Davies’ book, Flat Earth News. Facts still matter to the extent that they are necessary to fill pages and airtime, but according to Davies in newsrooms all over the UK the veracity of those facts is hardly ever questioned. Davies is a long time Guardian journalist who is well placed to spill the beans on the inside workings of Fleet Street. And spill the beans he does with a quarter of the book dedicated to inside stories of UK newspapers’ failings, from management bungling and bullying to newsrooms’ use of dodgy or outright illegal tactics in the chase for stories. Covered in particular detail are the slow death of The Sunday Times Insight team, the Observer’s support of Tony Blair’s march to war in 2002 and 2003, and the Daily Mail’s aggressive prosecution of everyone from asylum seekers to welfare organisations. In addition to his insider knowledge Davies has applied the research grunt of a group from Cardiff University. The researchers contributed a study of the ten largest UK newspapers quantifying the volume of stories originating from newswires and PR versus original reporting. This underpins much of the first part of the book covering the current working conditions of British journalists as well as the external influences that come to bear on their professional lives. In Davies’ hands it’s highly engaging stuff, peppered with anecdotes and written as well as you would expect of a seasoned professional. Nevertheless, it is a depressing read. The title of the book refers to news created largely as a result of the commercial and political pressures on media organisations. As Davies sees it news quality is in a death spiral. Most journalists are still struggling to do the best job they can, but against ever increasing odds and the results of their failure are visible every day. The evidence is visible in reporters paying scant attention to context and subtlety in the stories they are covering because of increased time pressures. In other words producing what Davies calls “churnalism”. The failure is obvious when newsrooms obsessively recycle the same stories other media are running to avoid being seen as behind the news agenda. And it’s clear to Davies that self-censorship is rife, with newsrooms choosing to run stories based on “safe facts and safe ideas” for fear of the “electric fence” of government or corporate interests. Government information management is pervasive and the power of commercial PR extensive. Added to all this is the ever increasing significance of the single biggest driving force for modern media managers – the EBIT line. It is very gloomy stuff, indeed. Davies has no great conspiracy to report. What he has identified is instead a consequence of the drive for profits in publishing running up against the need of governments, NGOs and commercial interests to control the flow of information. Which of course means there are lot of small conspiracies. And Australian journalists feature occasionally too, albeit somewhat out of context. Davies retells a story about the Murdoch owned National Star which received a tip off about information on the earlier disappearance of Jimmy Hoffa. After convincing the Star he had evidence the tipster persuaded the paper he needed $20,000 to hand it over. The Star reporter who flew to Cologne cash in hand to make the exchange was Piers Ackerman. As it turned out the evidence, inside an airport luggage locker, was a pair of old brown shoes supposedly worn by Hoffa when he was murdered. The shoes had never belonged to Hoffa. The Star ran the story anyway. Flat Earth News is rich with this sort of detail, and for anyone who cares about journalism it is confronting stuff. Davies is passionate about the cause but admits that in “trying to expose the weakness of the media” he is really only “taking a snapshot of a cancer”. The strength of the book is its passion for journalism and the depth of detail about the practical working lives of newspaper reporters and editors. Where Davies is a little less clear is on the philosophical underpinnings of journalism. On one hand he argues that truth is the primary obligation of journalism. But on the other hand he is equally adamant that objectivity in reporting is impossible. This raises an inherent conflict that Flat Earth News never resolves. If all reporting is necessarily and honestly subjective, what happens to truth? The closest Davies comes to answering this is by suggesting that honesty is the critical element of good reporting. The real problem, as this book points out, is that there is a conspicuous lack of honesty operating at all levels within the biggest newspapers in the UK. And because the media is still notionally operating within the traditional fourth estate role this lack of honesty is having a devastating effect, not just on the sustainability of newspaper journalism but democracy as a whole. Whilst Davies’ conclusion is pessimistic nevertheless there are glimmers of hope. 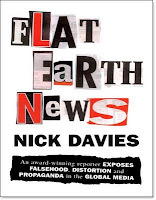 Anyone who loves newspapers ought to read Flat Earth News and grasp the truthiness of it.